Every girl's body is shaped differently. That's why there are so many styles, lengths, and shapes of prom dresses available on the market. For every body shape or figure type, there's just the right look and fit when it comes to formal dresses. Whether you are tall, short, or of medium height, or whether you are slim or full-figured, there's just the right prom dress that makes you look charming. So, why do different styles of dresses work with various body shapes? All clothing is designed to bring out or emphasize certain areas of the body. The clothing may also purposely de-emphasize certain areas of the body. This is to create a desired look and feel for the wearer. Clothing for women especially is designed to meet women's interests based on how they look in certain outfits or dresses. Some women want to emphasize their legs, some the upper portion of their body, some their waistline, and so forth. With formal gowns, homecoming gowns, and prom dresses, it's no different. Check out the different styles of prom dresses available for each body shape below. For the pear-shaped body, prom dresses with an a-line or full shirt are recommended to de-emphasize the hips. These should also have a fitted top to draw attention more to the upper portion of the body. If you prefer wearing a straight prom dress that's fitting to your body, try tying a thick or sheer scarf or wrap around your waist and allow it to hang in the front right above one of your legs. Or, a small tie-around purse or a unique belt that hangs loosely might do the trick. Wear jewelry and pull your hair up to attract attention to your face and upper body. Slim Figure - Show It Off! With a slim figure, you have many options. You can create "curves" with a bell-shaped dress and draw attention to the bust line. Or, you can wear prom dresses that bring out the waistline and wear a belt to create curves. Also, wear your hair down if you have long hair. Long, flowing hair also adds shape to your figure. Remember, the longer and straighter the gown, the more slender you will appear. The hourglass figure is coveted by many, but enjoyed by few! With this type of figure, pretty much anything goes. You can wear your prom dress long, short, sleeveless, with or without a jacket. Your figure doesn't have to be hid or compensated for. It can be shown off with almost any style dress. So, be creative and don't be afraid to show it off. With an apple-shaped body, you can try prom dresses that attract attention to the mid-section of your body. With a high waistline, you might not have to worry so much about dresses being too tight on the waist or hips. This gives you plenty of styles to work with to find the right fit. You can also wear a shorter dress if you have great legs. For a petite figure, try prom dresses that are shorter and more simplistic in design. Full skirts or ankle-length skirts can appear too large or long on a petite figure. Try dresses that emphasize the waistline or upper body and bring attention to your face and hair with simple, elegant jewelry. Earrings, necklaces, and hairpieces can all be used to highlight your face, neck and upper body. If you are larger up top, you can either wear dresses that de-emphasize the upper body or vice versa. To emphasize your upper body, look for prom dresses with good support as well as a great neckline. If you want to de-emphasize the upper body, wear a gown that attracts the eye to the hemline or waistline. Or, you can wear a scarf or jacket. 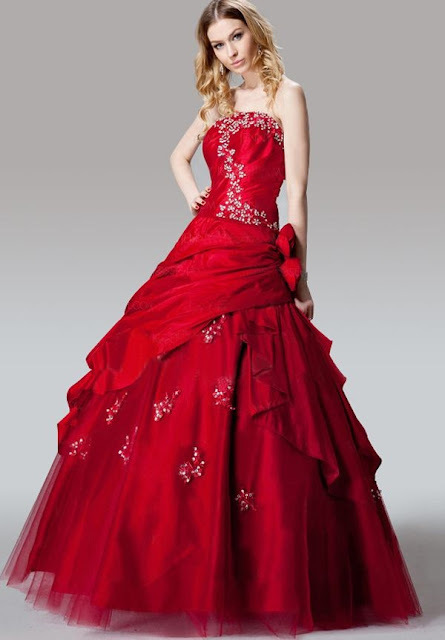 A great way to find an assortment of prom dresses and formal gowns is at an online prom store. You can find stunning designs by Mori Lee, Jovani, Clarisse, Niteline, Dave and Johny, Paris, Riva and Alyce Designs. From your own home computer, you can easily compare colors, sizes, styles, and prices online and find a variety of jewelry, prom shoes, and prom accessories to complete your ensemble. Accentuate your figure with a prom dress that's just right for you! A racerback bra is style of bra where the straps cross each other or meet in “T” shape across the back. This style is commonly used in fitness and sports bras, but can really be found in every type of bra, from everyday underwire bras to lacy formal ones. They usually have front closures due to the special back design, but they may have back closures or simply slip on over the head. Racerback bras are very popular style of sports bras for several reasons. The design keeps the straps from slipping off of the shoulders during activities and is purported to provide better breast support and enhance posture slightly by pulling the shoulders back, though these benefits vary from bra to bra. racerback bra can also be useful for dressier occasions, allowing the wearer to wear sleeveless shirt or dress without showing bra straps. Some racerback bras provide more of push-up effect than normal bras, giving the breasts more lifted, rounded look, as opposed to the traditional forward, cone-shaped look. Many bras come with convertible straps that can be worn either in traditional way, as halter, or in racerback style. This is convenient way to keep the bra straps hidden beneath many styles of shirts. Some racerback tank tops, for fitness or for everyday wear, have built-in bras so there is no need to wear separate racerback bra to avoid showing the bra straps. Any regular bra can be easily converted into racerback bra by pinching the straps together behind the back and securing them, either by sewing them, or with more temporary measure such as clip or an elastic band. In fact, there are several products made specifically for temporarily binding bra straps together to form racerback. Many women appreciate the freedom of movement and extra support provided by the racerback bra style. Others, however, complain that the close-set straps irritate the sides of the neck, or that the extra support translates to extra weight pulling on the shoulders. Sometimes, improperly fitting racerback bras can also rub the back or shoulder blades uncomfortably. Many women who have reviewed these bras recommend trying on several styles in stores before buying online to make sure they fit well, provide enough support, and do not chafe the neck or back. A posture bra, sometimes called posture brace, is bra intended to keep the spine in proper alignment, promoting good posture and possibly reducing pain. Most posture bras use strong, reinforced bands of material in the back, as well as extra support in the front and sides to help carry some of the weight that the muscles of the back would otherwise have to support. Most posture bras use front-closure design, due to the extra reinforced fabric in the back, but some do offer back closures. One can often purchase posture bra for close to the same price as regular bra, though some models might be more expensive. Most of the weight of the breasts is carried by the muscles of the upper back. Sometimes, back, neck, and shoulder pain are result of lack of breast support, which causes bad posture. posture bra aims to correct this problem. Usually, since plus-sized women and women with large breasts need the most extra support, posture bras are sold in larger cup and band sizes in plus-size stores and websites. Common complaint by reviewers is from small women trying to find posture bras in the correct size. A posture bra, in addition to the reinforced bands of material in the back, front, and sides, often has much wider shoulder straps than traditional bra. The wide straps distribute weight more evenly across the shoulders, reducing pain and making the bra more comfortable for long day of wear. The majority of reviewers support this claim, reiterating that, for everyday wear, posture bras are very durable and comfortable, but not the most flattering bras for tight outfits or night out. When choosing posture bra, one should decide which kind to get based on activity level and body type. One type, called longline design, is long enough to provide support to the entire torso to help maintain good posture during long periods of sitting or standing, such as during workday, or for women with larger breasts who may need more support. An athletic posture bra would be recommended for those who regularly engage in physical activity. Third kind of posture bra is made to closely resemble normal bra, which may be the most comfortable for those transitioning from normal bra to posture bra.